Talks between the leaders of the United States and North Korea are "truly historic" and bring hope for the start of a new era of peace, said Pope Francis's ambassador to Korea. Source: CNS/Vatican News. A "very important" new page has been turned, Archbishop Alfred Xuereb, Apostolic Nuncio to South Korea and Mongolia, told Vatican News. "It marks the beginning of a still long and arduous journey, but we are hopeful because the start has been very positive, very good," he said. 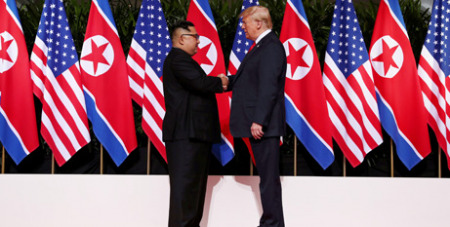 North Korean leader Kim Jong-Un and US President Donald Trump met on Singapore's Sentosa Island for the historic summit on Tuesday. It was the first meeting between a sitting US president and a North Korean leader. Afterward, President Trump said the North Korean leader would work to end North Korea's nuclear program. The President promised the US would end joint military exercises with South Korea. After the summit, Cardinal Andrew Yeom Soo-jung of Seoul, South Korea, and apostolic administrator of Pyeongyang, North Korea, celebrated Mass in Seoul's Myeongdong Cathedral to pray for prompt execution of the summit agreement. "When I heard the news that there was a meaningful agreement between the two summits in their first meeting, I deeply thanked God to remember our prayers for reconciliation and union of the Korean people," Cardinal Yeom said in his homily. "I sincerely wish that the agreement can be promptly executed to achieve the common good not only for Korean people but for all people on the globe." Archbishop Xuereb told Vatican News the rhetoric has gone from unleashing "fire and fury" against North Korea to more moderate language "that speaks of peace, of relations based on understanding, therefore, we are truly full of hope and confidence". "You can imagine how anxiously the Korean people and the church here in Korea are experiencing this truly historic moment," the Papal Nuncio said. "The Holy See wants to support whatever possible initiative that promotes dialogue and reconciliation" while also taking advantage of being able to take the Gospel message to everyone."